Beautiful girls red & ivory dress & bolero jacket for a baby, toddler, young or junior girl, perfect wedding wear as a little flower girl / bridesmaid or just for that special occasion including a Christmas party. 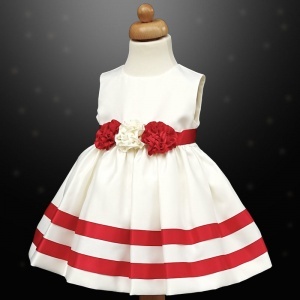 Dress: Elegant ivory satin effect sleeveless bodice, three large rosettes to the waist on a large red sash which then beautifully ties around at the back, discreet zip fastening to the back, triple-layered skirts for fullness; top layer is all ivory with two rows of shiny red satin ribbon bands around the hem, lining underneath with an additional mesh layer around inner lining. This dress & bolero jacket is brand new complete with clear cover packaging and hanger. Made by exclusive designers 'Visara'. Outstanding quality and made to the highest standards. Great service and good quality dresses just as advertised. Arrived ontime too. I ordered this for my daughter, the fit was perfect and very good quality. The service was efficient and I will use this company again in the future. Service and delivery were excellent and the item was just as seen and I absolutely love it! 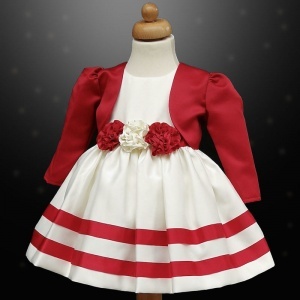 Is for my god daughter to wear at christmas and I can't wait to see her in it. Quality superb and with speedy delivery a bonus. Highly recommended! Just wanted to say these dresses are adorable. I searched everywhere in my town for matching flower girl dresses but nobody sold a toddler size to match with my older flower girl. I was recommended by one of my friends to look at this website as they had purchased from here before and was pleased with both the product and service. I purchased a 12-18 months and 6-7 years for my 2 little flower girls and was over the moon. They even came with a matching little bolero so I did not have to worry about looking for those aswell. Their service is impeccable, a delight and pleasure to deal with. I will definately be back for my little one's christening next year.